Greg & Kate House is one of the sweetest couples you’ll ever meet. We are so grateful that they’ve been attendees of the last two Escape To The Lakes, and that they are on the roster to perform at ETTL 2017! When they take the stage, they are known as The Asking. 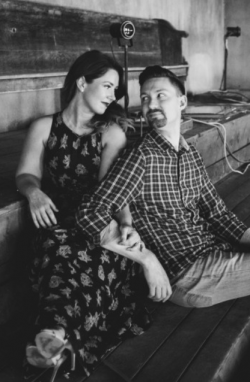 They just released their first full-length album Call The Ships Home (available on iTunes now), and we were able to catch up with Kate from this Michigan duo. UTR: How long did it take in your relationship to discover that you can make beautiful music together as a duo? Kate: We met at a summer camp in the Upper Peninsula of Michigan. We both attended as campers but weren’t really friends until we were on staff together. Greg was the worship leader and I sang with him. I had never experienced musical worship like I did under Greg’s leadership. He was (and still is) so passionate about singing God’s praises! We spent our free time playing and singing songs together and really connected over the calling God had on each of our lives to serve Him. From the beginning of our friendship it was evident God was calling us to serve Him together. UTR: Your first full-length album was a fan-supported effort. What was the process like for you with crowdsourcing? Kate: It was our first time crowdsourcing so it was nerve-racking. Thankfully, we had a lot of friends who had done it before and shared their wisdom with us! Once the Kickstarter launched it was incredibly encouraging. People seemed to come out of the woodwork to support us and that was both surprising and heart-warming. We ended up reaching our goal just past the half-way mark and were so encouraged. Friends have asked if we should have done more, but we don’t think so. We asked for what we needed, and our family, friends, and fans really came through. It was truly a community effort from the planning to the executing. That was our favorite part because that reinforced our belief that music fosters community. UTR: How did you land on the title Call The Ships Home? UTR: You teamed up with award-winning producer Roy Salmond. What was it like to work with him? Kate: Roy is brilliant! We really wanted to take this album to the next level, but did not know how to do that. When we first spoke to him about the album, he talked about his desire to collaborate with new, young artists and help them develop their craft. That was really important for us. We had the best time with him in the studio! He is extremely hard-working and collaborative. He is also one of the most encouraging people to work with. He offered countless ideas without expectation and ran with them until we were thrilled with the result. We are also really thankful for all the ways he pushed us. Roy exceeded our expectations and produced a record that we are extremely proud of. UTR: What are some of the overall themes you wanted to communicate through the album? Kate: Hope in the midst of brokenness, faith no matter the cost, courage to pursue what the Lord has for each of our lives. We have so much to hope for, believe in, and fight for. Because of Christ we get to live with meaning and bring light to the world. We are passionate about helping to inspire that in people. UTR: What was the best concert you ever attended where you weren’t a performer? Kate: It’s hard to pick just one, mostly because there are a lot of different reasons that you walk away from a concert saying, “That was incredible.” We both grew up listening to James Taylor so getting to see him a few years ago was definitely a highlight. He played for a little over 2 hours straight and only took about a 10 minute break. He’s so comfortable and dynamic at the same time. The Asking will be a part of the “Artists On The Rise” showcase at ETTL 2017. There new album is available now. You can get more info on them at theaskingband.com.